How to fix corrupt transaction links in Quickbooks? "A corrupt transaction link has been encountered"
"A corrupt transaction link has been encountered". "A corrupt transaction link has been encountered. Try to fix this problem by rebuilding your company file. 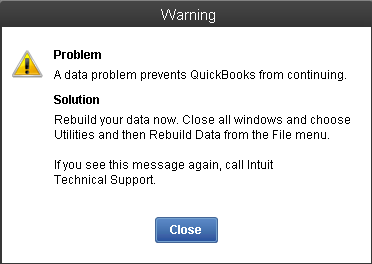 If the problem persists, contact QuickBooks technical support. QuickBooks will shutdown." QuickBooks depends on links between transactions to calculate A/R and A/P reports. Example of transaction links are Invoices linked to Payments, Invoices linked to Credit Memos, Bills linked to Vendor Payments, etc. A broken transaction link is a form of data damage that can cause your reports to be incorrect. To see the number of links in your company data file, press F2 to open the Product Information Window. The number of links is displayed along with the file size, number of transactions, and number of targets. The 'corrupt transaction link has been encountered' error indicates that QuickBooks has detected that one or more links in the data file are damaged. This error can usually be fixed by rebuilding the data file. However, rebuilding may not work in some cases if there is data damage.